Thermocouples are rugged and respond quickly to temperature changes. When sheathed, these temperature measurement instruments are extremely resistant to vibration, mechanical stresses, and aggressive/corrosive media. Because they’re small and highly bendable, sheathed thermocouples are ideal for use in tight spaces. Robust and responsive, thermocouples are widely used in a variety of applications and are an inexpensive solution for temperature measurement. A thermocouple consists of two dissimilar metal wires joined at a measuring point (hot junction). The other end is the reference point (cold junction), where the temperature is of a constant and known value. As the temperature increases at the measuring point, the different metals generate different voltages (the Seebeck effect). The difference in voltage at the cold junction corresponds to the temperature at hot junction. A sheathed thermocouple is a type of thermocouple where the wires are set in and insulated by a high-density ceramic compound, typically magnesium oxide, and then encased within a metal sheath. Common sheath materials are stainless steel or Alloy 600, but any metal that can be cold-worked could be used. Resistant to vibration and shock. The metal sheath and the MI cable protect the conductors from shock and vibration, preventing breakage and making sheathed thermocouples highly resistant to mechanical stresses. Resistant to corrosion and aggressive media. 316 stainless steel has good resistance against aggressive media and the vapor and flue gases in chemical media. The corrosion-resistant properties of Alloy 600 make it particularly well suited for thermocouples that have to deal with high temperatures. It also withstands cracking and pitting in media that contains chlorine, and corrosion produced by hydrogen chloride or ammonia in aqueous solutions. Small and flexible. The protective metal sheath allows for finer conductors and a more compact design than those of unsheathed thermocouples. 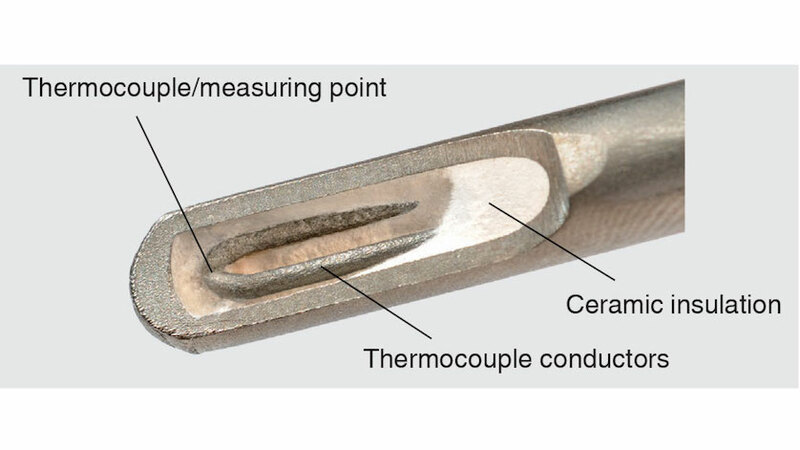 Sheathed thermocouples’ diameter can be as small as 0.25 mm (0.010″) without compromising the integrity of the instrument. The metal sheath also gives flexibility, which allows bending without damaging the sensing element. As such, sheathed thermocouples are particularly useful for temperature measurement in small spaces and in tight corners. Conductivity and high temperature limits. The metal sheath tolerates very high air temperatures: up to 850°C (1,562°F) for 316 stainless steel, and up to 1,200°C (2,192°F) for Alloy 600 – depending on thermocouple type. The sheath also provides better heat conduction than unsheathed thermocouples, thereby decreasing thermal lag time and resulting in even faster responses. WIKA produces complete lines of Type K, Type J, Type N, Type E, and Type T sheathed thermocouples. We also manufacture Type R, Type S, and Type B thermocouples in a wide range of temperatures and applications. Contact WIKA’s experts for more information.